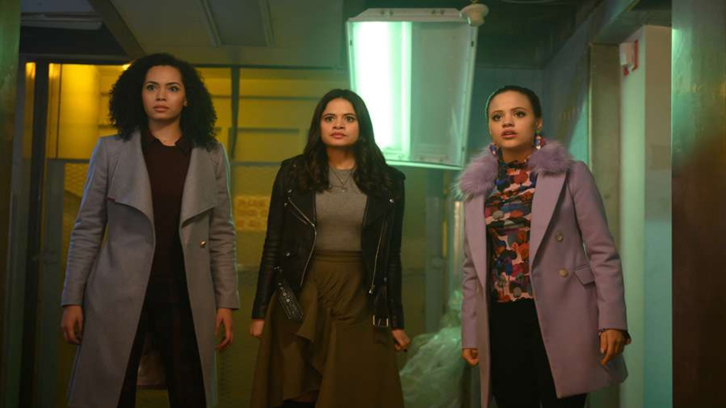 A STICKY SITUATION — While on the hunt for Jada (guest star Aleyse Shannon), Mel (Melonie Diaz) scours The Book of Shadows as Harry (Rupert Evans) and Charity (guest star Virginia Williams) cross reference them to find any clues that might lead them to this new demon. As if that isn’t enough, they discover that there is a Changeling Demon on the loose that puts one of the sisters in danger. Elsewhere, Maggie (Sarah Jeffery) signs up for a job helping to market a new dating app which could land her a summer internship. Macy (Madeleine Mantock) decides to go outside her comfort zone after a little encouragement from Maggie. Meanwhile, Mel is given a task by The Elders that she was not expecting. Ser’Darius Blain and Nick Hargrove also star. Vanessa Parise directed the episode written by Zoe Marshall (#108). Original airdate 12/2/2018.